Ms. Higgins: Good morning, Anna. Ms. Stuhl: Good morning, Flora. Ms. Higgins: Good morning, and thank you both for coming. How did you happen to get here in Monmouth County? How did your people get to Monmouth County? We'd like to know how you got here. Ms. Stuhl: I married Al. Ms. Higgins: How did you meet Al? Ms. Stuhl: How did you come to Monmouth County? Mr. Stuhl: That wasn't the question. First let me come to Monmouth County then we'll meet, that came later. I came in 1940 because my father decided that he'd like to have a poultry farm. I think his reasoning was that, having experienced the Russian Revolution to some extent, it's better to be on a farm then in a town. You eat better. I think that's the way he thought, but in any case he had decided that he was going to leave New York City because he had friends out here already. I was only seventeen, just graduated high school, and I ran the farm. Ms. Higgins: What kind of a farm did you have? Mr. Stuhl: We just had white leghorns mostly, and we did occasionally raise some broilers, but mostly it was leghorns. It was an egg farm, not a meat farm. Ms. Higgins: Where was your major market? Mr. Stuhl: The major market was probably New York, I would guess, because we had a feed co-op and an egg co-op. Ms. Higgins: You bought feed and sold eggs? Mr. Stuhl: Yes. Our eggs were distributed and they were picked up, processed, and distributed by the egg co-op. Ms. Higgins: What town was this, Al? Mr. Stuhl: We lived in Howell Township on Bennett Road next to Sam Bennett. He could've given you a long history. Ms. Higgins: Was it successful? How long did you run the farm? Mr. Stuhl: I would say the farm was successful because in 1945 when I came home from the war, my father said, "The farm is paid off." We did it without selling eggs on the black market, too, which is what most farmers did. During the war there was a black market in food, and people were getting all sorts of things that they might not have been able to get by the rules. Ms. Higgins: Did you need coupons for eggs? Mr. Stuhl: No, I don't think so. Mr. Stuhl: I enlisted in the army reserves in 1942. I was called up in March of 1943, or actually April 1st of 1943. So I spent about a little over thirty months in the army. Ms. Higgins: Where did you see duty? Mr. Stuhl: The Caribbean area. I got into the medics by accident, I guess, no will of mine. I thought I'd get into the Signal Corps because I had trained for it a little bit. But I got into the medics. The boat left New Orleans and headed straight for South America, and low and behold, we disembarked in Trinidad. So I got to see Trinidad, and there one day I was at an assembly and they called out my name and I became a medical lab technician. I went into training in Trinidad and that was my career as a soldier. Most of the time we spent on the island of Aruba. Ms. Higgins: It was an oil town, right? Mr. Stuhl: Definitely. It had the biggest refinery in the world. We had a small station hospital to serve the people who guarded the refinery and I guess there was some coast artillery there. I don't really know much about that. Ms. Higgins: And then you went back to Howell to run this poultry farm? Mr. Stuhl: What happened was in 1945, I asked for a transfer to Puerto Rico. I thought I would go to the University of Puerto Rico. Here I was sitting around, when I just wanted to go to school. Then I got a furlough and got married. Ms. Higgins: So how did you meet? Ms. Stuhl: His father and my father were cousins and his father and mother came to visit us in Quebec in 1941. We corresponded by mail after that visit. Mr. Stuhl: I went to visit you in 1942 in Quebec. Ms. Stuhl: When they came to visit they took pictures. One of them had a picture of me and he liked the picture so he came the following June to visit. Mr. Stuhl: We started corresponding by mail. Ms. Stuhl: It was a letter writing romance, which lasted about three years. When he came to visit, he wanted to get married, but I had just started college, and I was not getting married. Ms. Higgins: Where did you live? Ms. Stuhl: I lived in Quebec City, Canada. Ms. Higgins: You went back and forth to Quebec with this romance? Mr. Stuhl: Before I got called up, I went to visit her again. The first time I visited her was in 1942, and the second time was in 1943. Ms. Stuhl: And in the fall he came up. It was the summer, actually, in 1942. Mr. Stuhl: I came the summer of 1942, right. Ms. Stuhl: He wanted to get married. Mr. Stuhl: Two trips by bus. By bus and train. Ms. Higgins: All those letters. Where were you in college? What were you studying? Ms. Stuhl: I went to St. George, when it was a college. It is now Concordia University Montreal. I was studying chemistry and biology with a minor in English. I couldn't spell at that time, but I did very well in school. I was born in Romania. 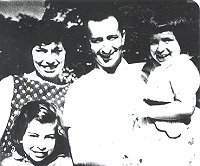 My family came to Canada in November of 1938. November 3rd, we landed in Quebec at night. Ms. Higgins: What language did you speak? Ms. Stuhl: At that point, I spoke Russian, Romanian, and French. Ms. Higgins: French must have enabled you to function in Quebec. Ms. Stuhl: We had been to Canada before. We had come in 1930; my father did not like it, and we went back to Europe. So I started school in Montreal. I went to first grade in Montreal. We lived in Montreal at that time. And then we went back to Europe in 1932. Mr. Stuhl: Your mother was the hero who made the family leave a second time. Ms. Stuhl: Yes, she insisted that we go. She did all the papers. My father was not very anxious to come, but she saw the war coming, and she was getting us out of there. So we came back to Canada in 1938. And my uncle, my father's brother, had a store in Quebec, a big store at the time. He gave my father a job and provided us with an apartment with enough groceries and canned goods that we had it through the whole war. We were never short of food. There was a closet underneath the staircase going upstairs, and that thing was full of food. He made it very nice for us. I cannot complain. And my aunt took me to school and she made me Anna. On my papers, it says Ann but she decided I would be called Annie and she was a Canadian born and she decided she liked Anna better so that's how I became Anna. It was different. I did high school in three years. Then I did a fourth year in Quebec because they started putting in what they called grade twelve, which was equivalent to first year college, and from there you went to second year college. Then I went to Montreal to go to college. Ms. Higgins: Did you do anything with chemistry? Ms. Stuhl: I worked at a paper mill one summer. That's about the only time I actually used my chemistry knowledge. After I had children, I thought of going back to school and doing something with chemistry. At first I thought I would become a Home Economics teacher because I liked that, too. I like cooking. I went to Georgian Court and I had a bachelors degree in chemistry and biology and they wanted me to start college all over again. So I said, "Forget it." And then I took an aptitude course in the night program. And they tested me and thought I'd come out good as a librarian. So I investigated going to library school, and I did. There Dean Martin encouraged me to go; he registered me right there and then. He registered me for fifteen credits the first semester. I started that first week, the second week I cut it down to nine. Ms. Higgins: Now what year was this about? Ms. Stuhl: I started in 1957. Ms. Higgins: So you had been married and had children? Ms. Stuhl: Yes, I had two children at the time. Mr. Stuhl: She was the biggest graduate there. Ms. Stuhl: I was nine months pregnant when I graduated. I had my third child in 1959, and graduated in 1959. Ms. Higgins: Was Al still running the poultry farm at that time? Ms. Stuhl: At that point, yes, but he was working off the farm. We still had chickens at the time. Mr. Stuhl: The farm business had not been too good. We were paying price supports for grain, and eggs were not supported. I can't imagine how people make a living with eggs today at the prices they are. But any case I culled chickens, separating the good from the bad for about ten years, I guess from 1951 to 1961. Ms. Stuhl: You went there when Dari was born. Ms. Higgins: For a company? Mr. Stuhl: For a company and then for myself. Ms. Higgins: What company was it? The Monmouth County Company? Mr. Stuhl: No. Ultra Life was the name of the company. And that company sold a feed additive to the co-op. When the co-op started to buy from this company in East St. Louis Illinois, they provided a service. They taught us how to do this thing called internal culling: palpating the organs of the birds. Ms. Higgins: And you could tell which chickens were going to be producers? Mr. Stuhl: Well, there's what you call inside characteristics and outside characteristics, and you combine them both. And you can detect if there were any problems with the chicken by exploring internally. Ms. Higgins: And what happened to the chickens that didn't make the grade? Mr. Stuhl: They went to the butcher. Basically it was done when people were going to keep birds over through a molt for the second laying season, which is no longer done today. So that business is all over. That would be good to select breeding chickens by using that technique. You could pick out things that you could not see externally. Ms. Higgins: And during this time frame, say the mid 1940s to the late 1950s, you lived in Howell? Mr. Stuhl: We lived in Howell until 1967. Ms. Stuhl: Then we moved to Ocean Township. Ms. Higgins: Why did you move to Ocean Township from Howell? Ms. Stuhl: Well, at that time I was working. Mr. Stuhl: We sold the farm. Ms. Stuhl: We sold the farm, but I liked the school system in Ocean Township at that time. It was one of the better ones. Mr. Stuhl: She decided to become a librarian. I decided to become an Industrial Arts teacher. We both took this night course at Red Bank High and we spoke to the guidance director who led us, very nice man, and we both got steered in the direction that we finally took. Ms. Higgins: You taught Industrial Arts for a long time, didn't you? Mr. Stuhl: Yes I taught for twenty-four years, but it wasn't all Industrial Arts because I ended up in the Essex County Youth House. And I taught in a classroom for about ten years. I was there for about twenty years. Ms. Higgins: To juvenile delinquents? Mr. Stuhl: Right. I used to commute to Newark. Ms. Stuhl: Basically that's why I selected Ocean Township. They had one of the best schools going including Tinton Falls, Shrewsbury. That area had good schools, but Freehold did not impress me. Because I got around on the bookmobile, my first job in the library was going around to the various towns in Monmouth County with the bookmobile. I didn't drive. I just met somebody who says they remembered me from the bookmobile. "You used to drive that thing?" he said. I never drove it. Don Price was the driver. Ms. Higgins: There were not any of the branches then that there are now. There was only the library in Freehold. Tell us a little bit about the library when you started. Mr. Stuhl: Before you start the library, let me tell my story. In 1940, I used to read in the New York Public Library and get my books from there in Manhattan and in Brooklyn. I lived in Brooklyn. So when I came out here I was interested in a library and I was informed that there was a branch at Ms. Foreman's house and she was on Howell Station Road. In her home she had a couple of bookcases with books and I could go there select books from there, and make requests, which she got for me. At that time, I was reading political economy, and she got me the books. Ms. Higgins: Where did she get the books? From the State Library? Ms. Higgins: Oh, through Freehold. Okay. Ms. Stuhl: This was known as the station. By the time I started there were some. I still had a few stations, but mostly they were gone. Mr. Stuhl: This was just a little library in the Foreman's house. Ms. Stuhl: It wasn't even a library; there were people on porches. Mr. Stuhl: A place where you could get books, and you had contact through the one on Main Street, right. Ms. Stuhl: They had pick up and delivery. Ms. Higgins: bookmobile pick up and delivery. Mr. Stuhl: No, bookmobile came later. Ms. Stuhl: They had bookmobile then, too. Mr. Stuhl: Not too extensive. Ms. Stuhl: But not for the public. By the time I came, every little town had at least a station. Ms. Higgins: How frequently would the bookmobile visit a station? Ms. Stuhl: At the beginning we used only one bookmobile. Ms. Higgins: Who was director of the library when you came? Ms. Stuhl: Julia Killian. She hired me. I can't remember statistics as such, but we did have what we called stations. In Ocean Township in the upstairs of the firehouse, there was one lady, Mrs. Levey, who took care of the books. And she sat there; she was basically a guardian of books. She didn't move, but she changed books. We used to go there at least every other month and then she could go on the bookmobile and select whatever books she wanted from the bookmobile. In addition, she could order. I don't quite remember how they sent in requests, but then we would search them through our facility and then they would go to the State Library if we didn't have them. And whatever we could we provided. We did not have as many duplicate copies as we did later so when we started, it was hard to get the best sellers. You got one book, and it had to do the library in Freehold, the old little house, whatever you want to call it, on Broad Street, and they also filled the shelves of the bookmobile so there was constantly a battle for new books. Ms. Higgins: It sounds very familiar even today even though we do buy many duplicate copies, there's still the battle for the new books. Was best seller reading such a mania then as it is now? Mr. Stuhl: The Book of the Month Club was really big in those days. Ms. Higgins: Oh, yes, and the Literary Guild. As you say, we can pick up the statistics in the books, but can you tell us a little something about the flavor of when you would pull up to this station? Would the public come on to the bookmobile and select? Ms. Stuhl: No. Not there. Besides that we had a regular schedule with about thirty to forty stops in the different areas. I added many more because as I was doing this, all these developments started cropping up. And where there's a development, there are children, and they like to have a bookmobile around, and so it came to Manalapan for instance. One of the biggest users was Neptune Township when it was part of the county system. There were two stops that I remember. Mr. Stuhl: But you used to go to Farmingdale Borough. The hook up there was really interesting. Ms. Stuhl: And in Neptune Township, for instance, we had a bookmobile stop in Hamilton Gardens as it was called. It was a development. And in somewhere between two and a half hours, I would say, we used to circulate over 1,000 books. And there was only a driver and myself. It got so bad that I used to get help. Another driver would come and help us, because not only did you have to get the books out, you had to card the books that came in and put them back on the shelves, so that somebody else could have them. There were only 2,000 plus books on the bookmobile. It was an interesting job; I met lots and lots of people, and people still recognize me from so many years ago. Ms. Higgins: Did the bookmobile travel up in the Bayshore or Middletown? Ms. Stuhl: Not Middletown. There were libraries in Keansburg which we put in, actually, and we developed it, it was in the Borough Hall. Union Beach had a little library that somebody started, and its now much larger than it was. Hazlet had bookmobile stops. Holmdel didn't have bookmobile stops, but they did finally have a little library. Ms. Higgins: Did you stop in the street? Ms. Stuhl: Yes, on the street on the corner. Mr. Stuhl: That's one of the reasons we moved to Wanamassa. She knew the area. Ms. Stuhl: I knew the area. I knew Wanamassa; Oakhurst, Ocean, too. They didn't have any library at all except for this little library over the firehouse in Wanamassa, which didn't do much business, and was only open like four hours. Deal had a library also in Borough Hall. They'd give them a room that had shelves; we provided the books, and the lady opened it, I think one afternoon and one evening. I think Interlaken still has that very part time library in Borough Hall. Ms. Higgins: How about Atlantic Highlands and Highlands? Ms. Stuhl: There was a library in Atlantic Highlands. Highlands, I don't remember, I think we had a bookmobile in the Highlands for a little bit. But it did not work out. Ms. Higgins: So those bookmobiles are like a traveling ambassador for the library system, right? Mr. Stuhl: It was very popular. Ms. Higgins: Did people line up to get in? Ms. Stuhl: Yes. They did a story on my bookmobile with Donald in the Asbury Park Press. The pictures of all these ladies with the carriages, adults and children came to the bookmobile. Mr. Stuhl: Did Mary ever go on the bookmobile? Ms. Stuhl: Mary Calleto, Rife her name is now. Now maybe she would come in and talk to you. You know where she lives? She lives in Kalamazoo, Michigan. But we do see her. Mr. Stuhl: She comes here. Ms. Stuhl: She hasn't been here in a long time. Ms. Higgins: Were your functions at the library limited to the bookmobile? Ms. Stuhl: At the beginning, yes, but the library was not so organized as it is now. I did cataloging. Catherine Mahar used to type the cards. I mean it was a very mom and pop operation compared to what it is now. Everybody did a little bit of everything. Ms. Higgins: As the branches were built, did the bookmobile service stop? Ms. Stuhl: Yes, and expanded elsewhere because Ocean Township was the first branch we had. The towns built the branches; we did not build buildings. Ms. Higgins: Did they come to you for guidance when they built them? Ms. Stuhl: Yes. And we worked with Ocean Township. I remember it was our first branch. Ms. Higgins: That's pretty exciting. Ms. Stuhl: Yes, it was very exciting. It was back in 1966 that it opened. Ms. Higgins: When did the county start staffing the branches? Ms. Stuhl: Right away. That was one of my ideas. When I went to graduate school you had to do a thesis, and it had to be on the place where you worked so I did where I had volunteered. I don't know how many hours I spent here. And the library and I go through sort of my own critique of what they did, and what I think should be done. And I came to the conclusion that staffing the branches was the best thing to do, because you can do with less books, if you have the right person helping. Ms. Higgins: So the whole extension system developed around this concept? Ms. Stuhl: I became the extension librarian, and then I became the assistant director. Ms. Higgins: Well, before we talk about your duties as assistant director, which I do want to get to, tell me something about the luncheons. The luncheons for the members. Members, of course, have a different political relationship with the county library. Ms. Stuhl: Well, member libraries were the libraries that existed before the county really blossomed. County library came in to existence in 1924, I think; they didn't start working until 1925. So it was a different sort of attitude, you know, they were there first. And we didn't really trespass, but we provided additional services, and we kept thinking of what kind of services to do. And we developed all kinds. There was a time when we did displays for them, of course, and we did requests, that's an ongoing business. And then we provided them with new books. And through the years we gave them McNaughton, for instance, which was a rental type of thing. The county paid for it. The members got so many new books per month. They were all best sellers. And then they could buy them at a reduced price if they wanted to keep them, or send them back. That worked very well, and after a while our budget increased enough so we could buy the copies for them. We started appropriating budgets for each branch for books. The library still does this. Jack Livingstone was very, very insistent that they had to keep in the budget. I don't know how it is now. Ms. Higgins: When did Monmouth County Library start providing children services? Ms. Stuhl: Anoter service I keep thinking we started was a part time librarian doing children's service. I don't know what year. Mr. Stuhl: Mary was one of your first ones. Ms. Stuhl: Mary, yes. She never did branches though, she did outside summer reading story hours. She did story hours for the bookmobile for me. Ms. Higgins: bookmobile provided story hours as well as books? Ms. Stuhl: In the summer, yes. But only certain places where they would let us have a lawn. You couldn't do it on the bookmobile. You couldn't seat fifty to sixty kids on the floor in the bookmobile, they would be squashed. People were very nice. They were very happy to have the service, and when bookmobile came, Mary used to come. I have pictures of them sitting on the lawn in Yorktown in Manalapan. I'll never forget it. Ms. Higgins: Because you didn't have a building? Ms. Stuhl: Yes, there was no building. Once we started having buildings, and we saw how nice it was to have story hours, we started sending librarians out first to do just story hours, and then to work a day in the library, and be sort of in charge of children services, and that increased in some places where there was a children's librarian on duty all the time. Ms. Higgins: One of the more appealing aspects of being a member librarian is that the county provides both the books and children services. Of course now we're offering a wide variety of automated services, as well. Ms. Stuhl: Yes, now we're doing a lot more with computers and the charging system. I mean I remember when we had to fight to get a Gaylord charging supplier for the members. We rented it. You didn't buy it; it wasn't that expensive, but at that time, it was a lot of money. 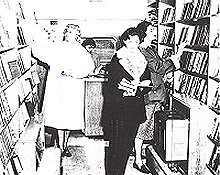 When I came to the county library in 1959 the total budget was $90,000. Mr. Stuhl: A librarian only made four to five thousand dollars. Ms. Stuhl: Yes. $4,640 was my beginning salary. Ms. Higgins: For a graduate. Mr. Stuhl: A graduate, yes, with a master's degree. Ms. Higgins: Was it full time work, Anna? Ms. Stuhl: Full time at that time was four days nine to five and a half an extra day because we worked one night nine to nine. Ms. Higgins: Even then the Monmouth County Library was open at night. Ms. Stuhl: Friday nights usually in the beginning, and then when we got bigger, it became three nights a week, now it's five nights a week. Ms. Higgins: You were the branch librarian in charge of the branches, weren't you? Ms. Stuhl: Yes, the extension librarian was in charge of the branches. Ms. Higgins: What was the second branch? Ms. Stuhl: The second one actually was Allentown. Ms. Higgins: How did that happened? Ms. Stuhl: Because I think partially they were still in the old building but they got the chance to buy the church where they are now. At first it was one room in a house, before it was in the church. It was small and crowded, and then they moved to the church. But they decided they wanted to be a branch, shortly after Ocean. Then we got Oceanport. They came in as a branch. And after that Wall, then Hazlet, and then Holmdel. And then I think Marlboro and Colts Neck. Ms. Higgins: This was all during the 1960s and early 1970s. The members were contributing the tax dollars and getting services, and the branches were setting up. Mr. Stuhl: What about Neptune? Ms. Stuhl: Neptune didn't have a branch. Neptune pulled out. Mr. Stuhl: And Belmar pulled out. And they're not part of the county system. Ms. Stuhl: Neptune was a shame, because we did have a lot of bookmobile stops and a lot of usage. It was personality feud, probably. And Belmar definitely the same. Ms. Higgins: This decision influences a lot of people, a lot of children, and a lot of adults, to this day. Ms. Stuhl: I don't know if they were happy with it. Ms. Higgins: So at this time was Headquarters in the old supermarket building? Ms. Stuhl: No, before that the main library was on Broad Street, and then we had an annex on Marcy Street where we did the book processing and extension services. Ms. Higgins: Two separate buildings. Ms. Stuhl: It was a nuisance: it was a problem to coordinate. Ms. Higgins: When did Mr. Livingstone become the director? Ms. Stuhl: Eastern Branch opened in 1968. He came the year before, 1967. Ms. Higgins: He put a lot of energy into developing the library with you. Ms. Stuhl: Yes, he was a good businessman, and a good supervisor. Ms. Higgins: And tell us about Eastern Branch. How did that get started? You were also a member of the Friends of the Monmouth County Library Association. Oh, before we leave the members, I brought it up before and reminded myself to go back to it. Talk to us a bit about the luncheons that you personally provided for the members. Ms. Stuhl: One of the things that was a problem to me personally is that none of the librarians ever got to see each other; they just didn't know each other. You know you worked there, and I worked here: our paths didn't cross. And since most of the member librarians were not library school graduates, they didn't have this feeling of networking, if that's the word to use. And so I thought it would be nice to get them all together, and what better way then to make a luncheon and invite them all over? So every year before Christmas, I did that, and I used to cook it all by myself. Ms. Higgins: What a labor of love! What would you serve, Anna? Ms. Stuhl: The library is still my labor of love. He gets mad at me because I'm still a little involved with the Friends, and I still come here. I sold Friends Cookbooks at Barnes and Noble. Ms. Higgins: How did that go? Ms. Stuhl: They sold six books. Mr. Stuhl: About those luncheons: she used to buy chickens. Ms. Stuhl: The county paid for the food; I kept receipts and they paid for the food. Mr. Stuhl: She served boneless chicken. We used to cut open the thighs. Ms. Stuhl: He used to bone the chicken for me, that's why he remembers. Mr. Stuhl: And she wraps them up. She made a complete dinner. Ms. Higgins: The member luncheons were so famous. Did you have any kind of bread with it? Ms. Stuhl: I didn't bake bread in those days as much. I made rice. I may have baked bread, but I don't remember. Ms. Higgins: What kitchen was this prepared in? Mr. Stuhl: She cooked everything at home, and we'd bring it. Ms. Stuhl: Jack Livingstone would pick me up in the morning with all these things to be all warmed up. I even had a rotisserie oven because I needed to heat some things. It worked out very well. Ms. Higgins: Everyone had a great time. Ms. Stuhl: Yes, and the member librarians got to know one other, which makes it much easier. You know if I think you may have something or you may know something, I call you because I know who you are. I have a face to connect to the name. It became much more personal. I think they still have the luncheons. Ms. Higgins: Now they're catered. The members get gifts, as well. Ms. Stuhl: Yes. Well, we would get calendars from the book distributor we were buying from. We'd give them out. Ms. Higgins: Did you bring desserts as well? Ms. Stuhl: Yes, cakes, sure. Mr. Stuhl: That's the first thing she always does: get desserts. Ms. Stuhl: I made a complete luncheon with some things before, and a main course. It was buffet style. Ms. Higgins: And who set all the tables? How many people would you serve? Ms. Stuhl: I don't know: anywhere between thirty to fifty people. Ms. Higgins: That's a lot of chicken. Would they bring their staff? Ms. Stuhl: Some of them would bring their staff, some didn't. Ms. Higgins: Well, as I say, that luncheon is an ongoing institution. Ms. Stuhl: It was a labor of love, there's no question about it. But they remember it. It did make an impact. It touched people, and I really feel good about that. It made such a difference. I would visit the member libraries and spend time trying to help them organize, trying to help them catalog, whatever jobs they needed help on. And you know when you could say, well, so and so in this other town is doing it that way, it wasn't like criticizing them, because you're telling them something is being done differently. Then they listened because, they knew who the other person was: they had met at a member luncheon. Ms. Higgins: Can you tell us about the energy of the Friends of the Monmouth County Library Association? Ms. Stuhl: The Friends were very influential in getting Eastern Branch built. They did a lot of PR work, a lot of pushing, and so on. They went to Freeholder meetings. I was not that involved in it. I had children, so I was busy. I didn't run around to meetings at night too often if I didn't have to. And so I don't really know the inside story. Mr. Stuhl: Tell Flora about how you used to bring in the branches to the county. Ms. Stuhl: Oh, that was later, that was here. Not in this building, but in the other, the Grand Union, where I did have room. Mr. Stuhl: She got a carpet downstairs. Ms. Stuhl: I'm trying to think why we stopped going to the branches. Ms. Higgins: Bookmobiles were in a state of disrepair at that point, weren't they? Ms. Stuhl: And they were all building libraries, and they were busy, and they just didn't feel like it. It went on for quite a while, but we used to exchange collections at the members. But after a while it became a problem and they sometimes forget I called up one or two persons to come to here to pick books. We had this big extension collection sitting there, and we wanted the librarians to use it. It was in the basement under the Grand Union building. Ms. Higgins: That was the genesis of the system whereby the branch librarians came to the extension collection. Ms. Stuhl: They could come in whenever they wanted, and then I started setting up a schedule. I saved some carpet we took out at home and I brought it down there, because the basement was damp. Nobody really liked being in the basement too long, but the carpet made it a little more homey, and this space provided a place where we could put the new books before they were shelved in the general collection. Ms. Higgins: Even with all your degrees in sciences and librarianship, it seems to me that your chief contribution has been a major, major public relations effort between the library and the public, library branches, and library members? Ms. Stuhl: Yes, part of it. I'm very conscious of having to please the customer. Ms. Higgins: Can you tell us about building the headquarters library here in Manalapan? Ms. Stuhl: Well, I'll tell you first more about the Eastern Branch. We were sued. Ms. Higgins: The County was sued? Ms. Stuhl: Yes. They delayed building for I don't know how long because of the Freeholders and the exempt libraries. (The towns that had libraries that did not belong to the county were called exempt because they were exempt from the county library tax. Ed.) They felt that using general county funds to build the Eastern Branch library was not legal. In other words, they were paying for some of this. It took a long time and much litigation till that was resolved. Their residents can use the library, nobody stops them from using the library. They just can't borrow a book, but they're not paying for the books. This was the rationale. The rationale worked, and they went ahead, but then they hit clay or something that also made a problem with Eastern Branch building. It took a while to straighten that up. Eventually we moved into Eastern Branch and didn't close any libraries because their businesses dropped off. Eastern Branch took off by itself, and they added to it. Ms. Higgins: Are we going to add to it again? Ms. Stuhl: They are going to add to the meeting room because the meeting room is so small. Mr. Stuhl: Yes. You know Jack started the jazz programs at the library. Anna was working at least two or three Sundays a month part of the year. Ms. Stuhl: For all of the years that the jazz program was at Eastern Branch. This was volunteer work. We did not get paid for it, we did not get time off, nothing. It was just Morey Berger, Jack Livingstone, and myself who were there every week, every time they had the program. Ms. Higgins: That's simply a remarkable contribution. Ms. Stuhl: As I said, it's been my labor of love. Ms. Higgins: By this time your children were how old? Ms. Stuhl: My youngest would've been eight or nine years old. The oldest would've been nineteen. Mr. Stuhl: I used to go with you to the programs. Ms. Stuhl: Not always but sometimes. Ms. Higgins: Didn't they make coffee? Ms. Stuhl: That's for jazz week. I used to make coffee and buy doughnuts. Between the jazz concert on Saturday night and the jazz sespers that we used to have, I served coffee. Ms. Higgins: Again, another famous institution: jazz concerts. Mr. Stuhl: We have friends living in our development now who used to come from Brooklyn to the jazz concerts. Ms. Stuhl: They still come to all the concerts. Ms. Higgins: Of course the price was right, too. Everything was free. Ms. Stuhl: The price was right, and the people performing were well known to people in New York. Better than here. Mr. Stuhl: In those days, it took over an hour to get there from New York. Ms. Stuhl: This Headquarters building was also built in part because of the pressure by the Friends. You have to give the Donowitz' credit because they used to go to the Freeholders meetings and they really pushed for a Western facility. We didn't have too many legal difficulties this time. Mr. Stuhl: You got the land donated. Ms. Stuhl: They tried to get Freehold Township to donate land. Mr. Stuhl: There was a smart mayor in Manalapan. Ms. Stuhl: And he came up with the land, so the Freeholders had to take it. So that's how this location came about. Mr. Stuhl: How could you turn down free land? Ms. Higgins: It's a difficult site, but they seem to have worked around it. Mr. Stuhl: It worked out nice. They had a good architect. Ms. Stuhl: Well, we didn't think so all the time. But Jim Farady was nice to work with. I was involved with the planning of this building. I retired in 1985 and they opened in 1986 here. Ms. Higgins: Of course the library development in both Shrewsbury and Manalapan is the result of the tremendous population explosion in Monmouth County. Can you tell us something about how life was in Monmouth County in the 1940s and 1950s compared to how it is now? Like transportation: did you go to Red Bank much? Ms. Stuhl: Not too much. We went to Asbury Park. Mr. Stuhl: Shopping in Asbury Park, certainly, and not only Steinbachs. Asbury Park was just a lovely little town. And it's just something that happened all over the United States where all the little towns folded all over, except Red Bank. Ms. Stuhl: Red Bank's probably the only town that remained. Ms. Higgins: Freehold's doing all right. Ms. Stuhl: Freehold's doing all right. But Freehold is the County Seat, so it attracts people from all over. The courts are here, there's business. We were living very close to Asbury. Ms. Higgins: Did you go ocean bathing? Ms. Stuhl: Not much. I'm not much of a sun worshipper. Once in a while. Mr. Stuhl: I went to the YMCA in Asbury Park swimming and playing ball. Ms. Higgins: Asbury Park had a good boardwalk. Mr. Stuhl: Yes, we went on the boardwalk. I had lived in Brighton Beach as a kid, but I didn't go to the ocean very much, I went to the pool to swim and I played handball. Ms. Higgins: How about your children? Ms. Stuhl: They're all swimmers. Mr. Stuhl: Well, they went to camp. Ms. Stuhl: They went to camp. They went to Happy Time Day Camp, which I believe is still here down on Route 537. Ms. Higgins: What kind of a camp was it? Ms. Stuhl: They came and they picked them up. In Freehold, I think not at the house. This was all in Howell. When we moved to the shore, we were one mile from the ocean. They could bicycle when they were older. They all love it still. My oldest has a home down on Long Beach Island because she loves the ocean, and the other two come visit because they love the ocean. Ms. Higgins: It's a good place to bring up children. Ms. Stuhl: Oh, yes, the nice thing about the chicken farm is that the children knew their father. He was in and out of the house. If he babysat he took the children into the coop with him. He put them on the conveyor, and the kids would sit on that and they rolled on through the chicken coop. Mr. Stuhl: The older ones have a little memory of it. Ms. Higgins: Sounds like fun. Ms. Stuhl: Yes, well, I didn't like the chicken farm. Mr. Stuhl: Coming from the city, to me, farming was great. You could do things you couldn't do in the city, and I wish I would've had more sense. I would've been gardening. In those days I didn't garden. Ms. Stuhl: Now he gardens. Ms. Higgins: Maybe you could tell us some recollections of George and Doris Handzo. Ms. Stuhl: Yes, I miss them. I really do. I don't know how many times a day I think of them you know or something comes up and I say, "Doris used to say this or that." I met them because Colts Neck was talking of a library shortly when Julia Killian was still director, so shortly after I started working. We were invited by a family in Colts Neck. I can't remember the people's name who invited us. George and Doris were invited also, and Julia came, and we discussed the possibility of having a branch in Colts Neck. Doris wasn't a librarian yet. She was going to library school. Mr. Stuhl: Was she teaching school? Ms. Stuhl: No, she taught school before she got married. Doris' first job was actually at the Ocean Township Library. She was our first branch library director. Ms. Higgins: Didn't the Ocean Township Library also launch Mrs. Field? Ms. Higgins: Our current assistant director. 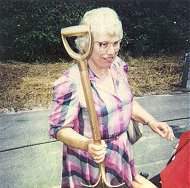 Ms. Stuhl: Doris worked a bit at Wall, too. I worked all the branches, at least Saturdays. We rotated branch librarians. That's also my deed, because I thought they should know each others' collections. I mean it's worked for me. I don't try to interfere. Ms. Higgins: So when did you first meet Doris Handzo? Back when they were down in Colts Neck? Ms. Stuhl: In the early 1960s, I can't remember the exact year. But we did nothing about a branch. I put a bookmobile in Colts Neck at that point. We put in a bookmobile stop near school and another one near the reservoir, whatever that development was called, I forgot: maybe Phalanx. There were new developments in there. And they worked; not as busy as some other places, but they're all rich people in Colts Neck so they go to Barnes and Noble. I was amazed to see so many people tour through the place and walk out the door. Ms. Higgins: Did you say Doris became a librarian? Ms. Stuhl: Doris somewhere in that point was either going to school at that time. I didn't discuss much. I did not know her well. But by the time she finished library school, we were opening up the Ocean Township Branch. I talked to her and she came in as director and she did a beautiful job. Through the course of the years, she became my friend. We were very close friends at the end. George became Mayor of Colts Neck; he had always been involved in politics and he was on the school board too, before I met him. And then he became interested in town administration. Ms. Higgins: He was the Township Manager. Ms. Stuhl: First he was mayor. Afterwards, when he retired, he became the Township Manager. And when he was Township Manager we got the library in Colts Neck. Ms. Higgins: I think the Handzos, like the Stuhls, are just another example of the quiet people who have made such a tremendous impact in this county, and for the good. I think you should both feel very good about that. Ms. Stuhl: Well Doris was very, very helpful. They were nice people and I'm still in touch with their children. If we go to Texas this next Fall as we planned, we will go look them up. Ms. Higgins: I ask people some "what were you doing" questions, just to kind of put some pins into the 20th century. Let's start with FDR: Where you were when FDR died? and then Kennedy? Ms. Stuhl: I was in Canada. I was not here. My grandmother was in the nursing home she was in a coma and it was pretty quiet and then all of a sudden this lady screamed, "Roosevelt died." And a patient, who was a younger woman who had jumped from a burning fire on the second floor, was paralyzed. But her head was all right. She was in the same nursing home. And she heard that on her radio, and of course that made an impact. My grandmother died the day after. Ms. Higgins: And then when Kennedy died? Ms. Stuhl: When Kennedy died, I was substituting in the Howell Nursery School where my children were going. It's down on Emmons Ave. and the mothers would take turns. I was there substituting being outdoors with young children in the yard, and the neighbor came over and told us about JFK. Mr. Stuhl: I don't remember where I was when Roosevelt died. I do remember where I was when Pearl Harbor came. Ms. Higgins: Where were you? Mr. Stuhl: I was painting the chicken coop that Sunday morning, and I came in the house and they told me that the Japanese had bombed Pearl Harbor. I was teaching shop in Keyport when Kennedy was shot. Ms. Higgins: Were the children aware of the magnitude of this? Ms. Stuhl: For Kennedy's funeral, I remember we went to our neighbors, the Bragars, and all the kids were there and sat and watched the whole thing. Mr. Stuhl: Well, they did such a job on Kennedy's funeral with the train, you know, then in Washington with the ceremony, and the coffin, with the rifle, and the riderless horse. Ms. Stuhl: And they had TV by then. Ms. Higgins: Your lives have seen a lot of technology. You and I were talking about the television, because when you were growing up there was no television. Ms. Stuhl: I didn't even have a telephone in Europe. I did have a telephone in Canada. Ms. Higgins: No jet planes. Ms. Stuhl: No planes. No, we came here by boat. Ms. Higgins: And of course back and forth you went. Ms. Stuhl: I crossed the Atlantic three times. Ms. Higgins: God bless your mother. So, Al what would you say are some of the big things in technology that you can look back on in the 20th century? Mr. Stuhl: Well, communications have made a big difference. Everything has its advantages and disadvantages, and as you get older, you get to see the disadvantages. To see the way Anna worked in the library, and to see the way it's done today. It's just too big to be personal. And more or less, the families are split up today because kids take jobs all over the country. There's opportunities all over. These are the big changes that I see in personal lives. Then communications and the fact that information is all over the place. In fact at my age-- I'm approaching seventy-eight--and I can see where there's a flood of information. I can't even keep up with it. I can't keep up with the reading I want to do. It's changed so much. I feel sorry for these native peoples and others who just try to retain their culture, which is so different from what we have today. And I say why don't they just decide that they have to give up a little bit and accommodate to the dominant culture, and still hold on to the culture. Those are the things that affect people today. We have everything on the Internet with the punch of a key or a mouse. There's a lot of advantages to it, and the other hand, there's disadvantages also. How will things balance out? I don't know. I'm waiting for someone to write a book explaining it to me. Ms. Higgins: Well, we all have to find our place in this sea of information. Mr. Stuhl: You have no choice. This is it. We finally got computers. Ms. Stuhl:I'm learning to use computers. Ms. Higgins: Tell us more details about the poultry farming years in Monmouth County. Mr. Stuhl: Well, it seems that we had a very good market in the city of New York. I think most of our eggs from this area went to New York; possibly some other areas fed to Philadelphia. But basically, we couldn't probably supply the whole market. So there's no problem. There was room for so many farmers and everybody's eggs would be sold in New York, except people who had different routes. The really good thing about the farming is the way of life. We had cooperation. When we were small in the beginning we worked together on different tasks, such as vaccinating chickens, housing chickens, and I remember separating the baby chicks, things like that. We did it in a group. We'd get together, and it really was nice. When I came back from the army, people had expanded. You started having professional vaccinators, and people would have to hire help, it was more than just a family farm after a while. And being on the farm was nice: you raised your children. Ms. Higgins: It was a good living. Mr. Stuhl: It was a good way of life. But like everything else it couldn't last. Because things have to grow, and as things grow there have to be changes. Ms. Higgins: I see a parallel with the library world and the farming world. Mr. Stuhl: When people started with dairy farms, the family would work on the dairy farm and the kids would stay there. When the kids started moving out, you'd have to get help, and the next thing you know you were employing people. Ms. Higgins: It was business. Mr. Stuhl: And it was business, and you had to do it in the business way, and business has to grow. It doesn't stay still. And when it grows, it gets impersonal. That's the problem. Ms. Higgins: What were your recollections of the Roosevelt years? Mr. Stuhl: The NRA was Roosevelt's program to get us out of the Depression. I remember when people's furniture used to be put on the street if they couldn't pay the rent. I'll never forget that when it happened to a friend of ours. He and I just took a nice long walk on the Boardwalk to the Coney Island, stayed away for the whole day until the adults figured out where to put the furniture. Ms. Higgins: This was in the 1930s. Mr. Stuhl: This was the 1930s. Ms. Higgins: Trying to pull out of the Depression. Mr. Stuhl: Well, we pulled out of the Depression when the war started actually. Because in 1937 they had what they called the recession. It was a period when things were moving up slightly. Roosevelt was putting people to work with WPA, PWA, and the CCC. So people had something to do. That helped the economy a little bit, but then there was this recession in 1937 and then the war came around. By 1940, I'm sure military manufacturing became involved, I don't know. Ms. Higgins: Eisner's right in Red Bank made military uniforms. It was a big influence in our county. Mr. Stuhl: I remember when Roosevelt was packing the court, trying to pack the court, to get some of his things through, because he had a very conservative court, and they didn't want to make any changes. He was trying to get enough people on it so that he could get a majority vote and, of course, it was unconstitutional. Ms. Higgins: Well, you were pretty young then to be aware of all that going on. Mr. Stuhl: Well, I was about ten or twelve years old. I remember that. Ms. Higgins: Do you remember anything about the Roosevelt town when it was built? Mr. Stuhl: Roosevelt, New Jersey? Ms. Higgins: Yes, our little town here in Monmouth County. Mr. Stuhl: Yes, we've been there because Anna put a couple of little libraries there. Ms. Stuhl: We had a station there, too. We had a library there. Mr. Stuhl: And we saw there a mural by Ben Shahn. Nice little town. They're having problems today, though, just surviving. Ms. Higgins: Maybe what your talking about here is another theme: trying to stay small is not always the solution. Ms. Stuhl: But it's a different town now. It still retains some of the artists and people like that. Mr. Stuhl: I forget what the problem was. It was in the paper recently that they are having a big financial problem, I guess. Ms. Higgins: They are trying to maintain their own police force. Ms. Stuhl: Which is hard to do. It's the same thing with libraries. They're not very much involved anymore, but they still do something with the library and are still considered a member. We used take the bookmobile out there every other week. Ms. Higgins: Seems like if anyone in Monmouth County wanted a book, Monmouth County Library would get it to them one way or another. Mr. Stuhl: Well, the way things are now, you can get books from anyplace. I mean libraries are all connected. It's amazing. So that's a really great advantage. Ms. Higgins: Do you remember anything about the troubles at Fort Monmouth? Can you talk about that a little bit? Mr. Stuhl: Yes. You're talking about the McCarthy era. I met a guy who was involved with the whole business, and I knew some people who became farmers. One lost his job, never went back. I know that not one case held. There was not one case where McCarthy succeeded in finding anybody in the left wing or anything. Ms. Higgins: But there were a lot of lives really seriously interrupted. Mr. Stuhl: Messed up a lot of people. Ms. Higgins: Ira Katchen was the attorney for that. You weren't personally affected, but you knew people? Mr. Stuhl: No, we were on the farm; we had nothing to do with it. I met some people afterwards who went through it. Ms. Stuhl: Yes, every once in a while you meet somebody who remembers that. Mr. Stuhl: Murray Miller never said anything about it, and I don't recall asking him. Ms. Stuhl: Beth Miller's father was one of the commissioners here. He was on the Ocean Township library board. He was very influential getting Ocean Township to become a branch of the County Library. Ms. Higgins: Murray Miller was at the fort? Ms. Stuhl: He worked at the fort. Ms. Higgins: As you look at the 21st century unrolling, even as we speak here, we're almost at the end of March, what would you like to tell to people who might be listening to this tape or reading the transcription in fifty or seventy-five years? You've lived a while, you've had some experiences! What would you like to pass on to them in terms of some advice? Ms. Stuhl: I think all people are important and they should become considerate of one another and be tolerant. Mr. Stuhl: They should appreciate diversity, and have a great measure of tolerance for diversity, and everything would be much better. The other thing, unfortunately, there's nothing much you can do about it, but when all the women started working, and you had help taking care of the children that's not family oriented. We are so far away from what has been done in Europe as far as taking care of families. We talk about families and we don't care a bit about them. Because if we did, we'd let people have flex hours so that they could raise their children, and there would be less pressure, because it takes two to make a living now, and I don't think that they are living that much better with two working than when one used to work. Ms. Stuhl: It's very expensive to live now days. I can remember my kids when babysitting was fifty cents an hour and not always that much. Now it's five dollars an hour. Mr. Stuhl: It was a quarter an hour when we started with kids. Ms. Stuhl: It becomes a problem; you go out one night once in a blue moon and it costs a fortune for young people. Mr. Stuhl: How do you go out when you have to pay five or six dollars an hour to go out? You spend fifteen or twenty dollars before you even turn around to eat or go to a movie, so you have to make a lot of money to afford that, and not everybody is making that kind of money. That's the biggest point that Robert Reich made. The former Secretary of Labor in the Clinton Administration, Robert Reich wrote in his book, " that spread between the rich and the poor is getting greater and that is a danger." And he tried to make Clinton aware of this. I don't think Clinton ever appreciated it, and I don't see anybody else on the scene who will do anything about it, and that is the problem that we are going to face in this century. We still have something like twenty percent of the kids below the poverty level. That's terrible in the richest country in the world. Ms. Higgins: That's definitely a project for the 21st century along with increasing tolerance. Anna, would you add anything to that? Ms. Stuhl: Well, I'm not so politically in touch. Mr. Stuhl: That's not political, that's dealing with families. How are families doing? Ms. Stuhl: Well, families have much worse problems now. Mr. Stuhl: We've got single parent families in this country to the extent that we never had. In the worst period of the Depression, families stuck together. Now you've got I think maybe one-quarter to one-third of the kids are living with a single parent in a house. Ms. Stuhl: That's one of the problems you're going to have to work at in the 21st century. Ms. Higgins: Well, I really appreciate you being here this morning. Mr. Stuhl: Oh, it was a pleasure. Ms. Higgins: It was a real pleasure for me. Mr. Stuhl: I'm sure I didn't think of everything I'd like to talk about. Ms. Higgins: We never do, do we?